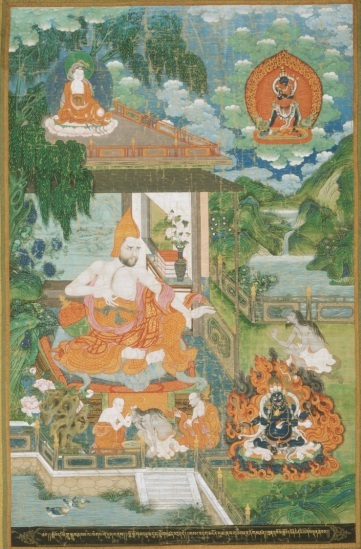 Born to a royal family in Malyara, in South India (although some Chinese sources claim it was in Magadha, in North India), Bhāviveka studied both sūtra and śāstra literatures during his formative years. Having excelled in the art of debate, especially against Hindu apologists of the Saṁkhyā School, he is said to have been the abbot of some 50 monasteries in South India. His chief influences were the writings of Nāgārjuna (c. 150 – c. 250 CE), the founder of the Madhyamaka, and treatises on logic from the traditions of Buddhism (especially Dignāga’s works) and Hinduism (especially the Nyāyapraveśa). His chief philosophical contribution was his attempt at formulating a synthesis of Madhyamaka dialectics and the logical conventions of his time. As all of Bhāviveka’s works are lost in the original Sanskrit and preserved only in Tibetan translations, the scholarly world came to know of him only through Candrakīrti (c. 580-650 CE), who refuted Bhāviveka’s position in the 1st chapter of the Prasannapadā (Clear words). It could therefore be argued that current understanding of the Madhyamaka in general has suffered from a one-sided perspective that relies solely on Candrakīrti’s rival school, the Prāsaṅgika-Madhyamaka. However, contemporary scholarship no longer neglects Tibetan sources, and thus a more balanced approach has ensued, one that reads Nāgārjuna’s seminal writings through the commentaries of both the Prāsaṅgikas and the Svātantrika. a philosophic strategy that was nearly incomprehensible to scholars of the Madhyamaka, who knew this school only through Candrakīrti’s Prāsaṅgika systematization. - this latter level was a bold innovation in the history of Madhyamaka thought. Of course, such a distinction was operative only within the realm of conventional thought. Again one must employ Bhāviveka’s crucial adverbial codicil, paramārthataḥ, and follow him in claiming that such a distinction, like all distinctions, is ultimately unreal although conventionally useful. - are evaluated diversely by contemporary scholars. Those unsympathetic to him see his work as an unhappy concession to the logical conventions of his day, a concession that dilutes the rigor of the Madhyamaka dialectic. Those with more sympathy see his contributions as a creative surge that rescued Buddhist religious philosophies from those dialectical negations that threatened the integrity of the Buddhist path itself. The 5th chapter of his Tarka-jvālā, the “Yogācārattvaviniścaya,” refutes both the existence of the absolute and the non-existence of the conventional, both seminal Yogācāra positions. A siddhānta text devotes ordered chapters to analysing the philosophic positions (siddhāntas) of rival schools, both Buddhist and Hindu. of the positions held by the Hīnayāna and the Yogācāra, both Buddhist schools, and the Saṁkhyā, Vaiśeṣika, Vedanta, and Mīmāṁsā schools of Hindu philosophy. His Nikāya-bheda-vibhaṅga-vyākhyāna remains one of the most important and reliable sources for the early history of the Buddhist order, and for information on the schisms within its ranks.